For patients missing numerous missing teeth or a full row, traditional partial and full dentures used to be the only smile restoration option. These replacement teeth allow patients to speak clearly, chew a wider range of foods, and smile with more confidence. However, without replacing the supportive root structures of lost teeth, dentures only complete half of a smile restoration. Dental implant supported dentures allow us to repair the smile from the roots up for natural looking and feeling results. If you want to learn more about your restoration options, call to schedule a tooth replacement consultation at Harrisonburg Family & Cosmetic Dentistry today. We’ll work with you to plan for the best possible tooth replacement to keep you smiling. What is an Implant-Retained Partial Denture? Implant-retained partial dentures are used to fill in the gaps left by numerous consecutive and nonconsecutive missing teeth. A gum-colored base is molded to fit between the remaining dental structures, supporting replacement teeth. 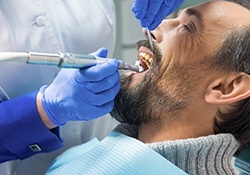 Two to four strategically positioned dental implant posts are typically all that is needed to provide the necessary support for these prosthetics. What is an Implant-Retained Full Denture? An implant-retained full denture is similarly crafted from a precisely molded gum-colored base material that supports an entire row of replacement teeth. Four to six implant posts are positioned to provide the necessary support for these prosthetics. 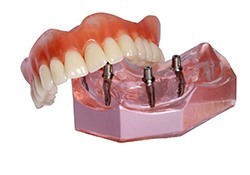 What is an Implant Supported Fixed Denture? An implant-supported fixed denture is similarly crafted as an implant-retained denture, but these types of dentures can only be removed by a licensed dental professional. Dental implant tooth replacement is a multi-phase restoration process. The first phase of treatment is preparing the smile for treatment. This can include treatment to improve oral health, tooth extractions, and tissue grafts. The next phase is the surgical placement of two to six implants. Then, patients wait for several months as their implants fuse with the supportive tooth structures, mimicking the tooth roots. Once the implants are firmly fused with the gum line, we’ll design and place your custom partial or full denture. 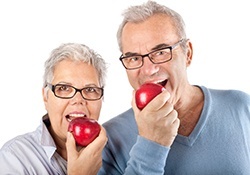 Why Would I Choose to Switch to an Implant Denture? Dental implant retained dentures provide 70% chewing function compared with just 10% restored chewing ability. This significantly improves diet. The increased stability also leads to clearer speech and confidence to smile without concern about slipping dentures. 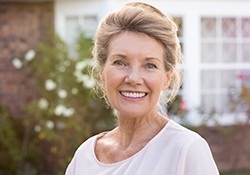 Traditional dentures need to be replaced every five to ten years, but an implant supported denture, will stay firmly in place for twenty years or longer with proper care. Traditional tooth replacement prosthetics place pressure on the gums and jawbone, leading to diminished density and volume over time. Dental implants mimic tooth roots, providing the necessary stimulation to maintain gum tissue volume and jawbone density for superior oral health.